Here we will learn how to use the formula to find the area of trapezium. 1. The length of the parallel sides of a trapezium are in the rat: 3 : 2 and the distance between them is 10 cm. If the area of trapezium is 325 cm², find the length of the parallel sides. Therefore, the length of parallel sides area are 26 cm and 39 cm. 2. 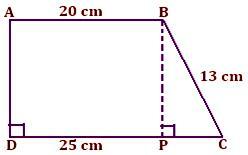 ABCD is a trapezium in which AB ∥ CD, AD ⊥ DC, AB = 20 cm, BC = 13 cm and DC = 25 cm. Find the area of the trapezium. 3. Find the area of a trapezium whose parallel sides are AB = 12 cm, CD = 36 cm and the non-parallel sides are BC = 15 cm and AG = 15 cm. In trapezium ABCD, draw CE ∥ DA. 4. The area of a trapezium is 165 cm² and its height is 10 cm. If one of the parallel sides is double of the other, find the two parallel sides. Therefore, the two parallel sides are of length 11 cm and 22 cm. These are the above examples explained step by step to calculate the area of trapezium.